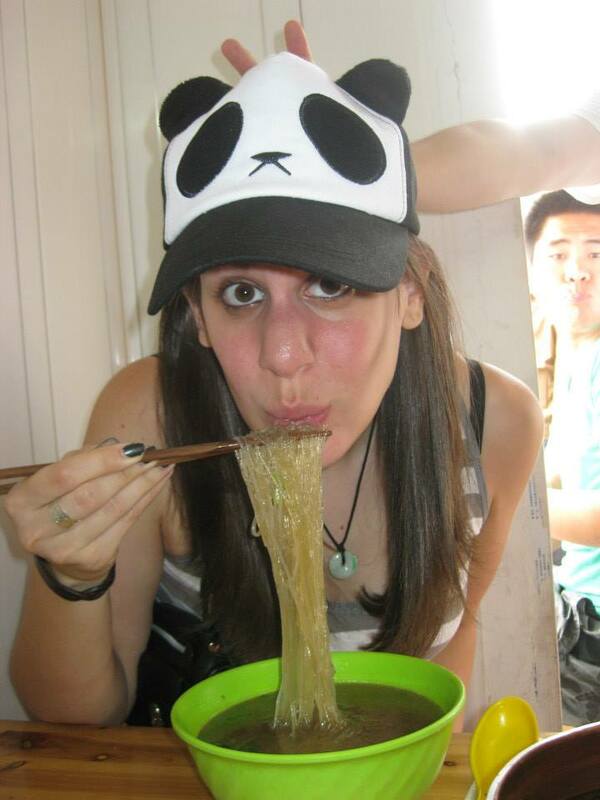 Eating a bowl of noodles in Nanjing, China that cost 7¥ (yuan): less than $1.50! Studying abroad, although costly, is not necessarily as impossible as one might think for the ‘poor’ college student—and it certainly has its perks. One way to help pay for your study abroad trip is to get scholarship money. Just like when you were applying for college, scholarships are diverse, obscure and available to a multitude of people. You just need to be willing to look for them. One great place to start is CEA Scholarships, which are scholarships specifically for students who want to study abroad. There are multiple merit based scholarships available and also financial need based scholarships. Often times when applying for these scholarships you are required to write a personal essay. In order to get the money you need to make yourself stand out. Write several different essays, share them with your writing major friends, revise, and edit. The more work you put into your essay, the better chance you’ll have at getting that money. Other scholarships to look into for studying abroad are the SIROCS scholarship and the SASA Travel Abroad Scholarship. 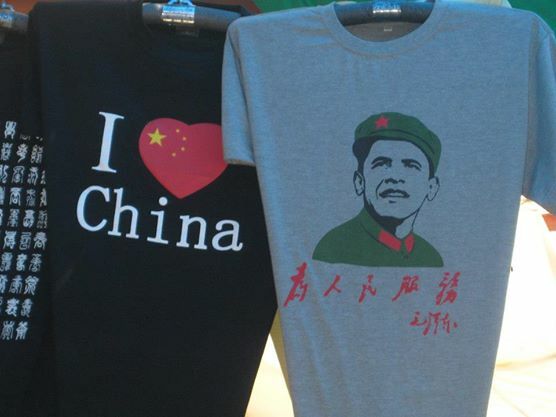 You never know when you’re going to stumble upon some interesting souvenir like a Communist Obama Tshirt! Don’t be afraid to go and contact the financial aid office at your college. Even if you don’t think you qualify for financial aid, go anyway. Sometimes the financial aid rules and regulations differ for certain study abroad programs and it never hurts to ask! Taking out student loans might also be a viable option to look into. Loans are a really great way to give yourself some time to save up your money after you take advantage of this once-in-a-lifetime opportunity. Start saving up now! Even if you get fully covered by scholarships or financial aid, there’s still the matter of having spending money in a foreign country. Whether you want to buy a cheap bowl of noodles, or a memorable souvenir, you’re going to end up wanting to spend some cash on your trip. In Shenzhen, China I came across an amusement park called Windows of the World. I was definitely glad that I had some cash to pay for the admission. Get a part time job while you wait for the start of your program and put that cash aside. You’ll be happy you did once you get to your new temporary home. You want to be able to take care of yourself while you’re away and have some fun too! 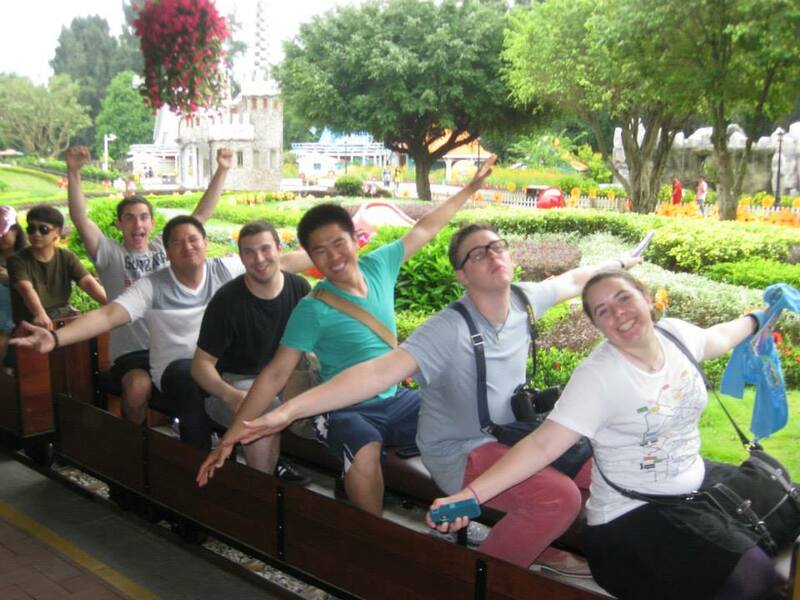 My friends on the train ride at Windows of the World in Shenzhen, China. Follow the Campus Clipper on Twitter and Like us on Facebook! Interested in more deals for students? Sign up for our bi-weekly newsletter to get the latest in student discounts and promotions and follow our Tumblr and Pinterest. For savings on-the-go, download our printable coupon e-book! 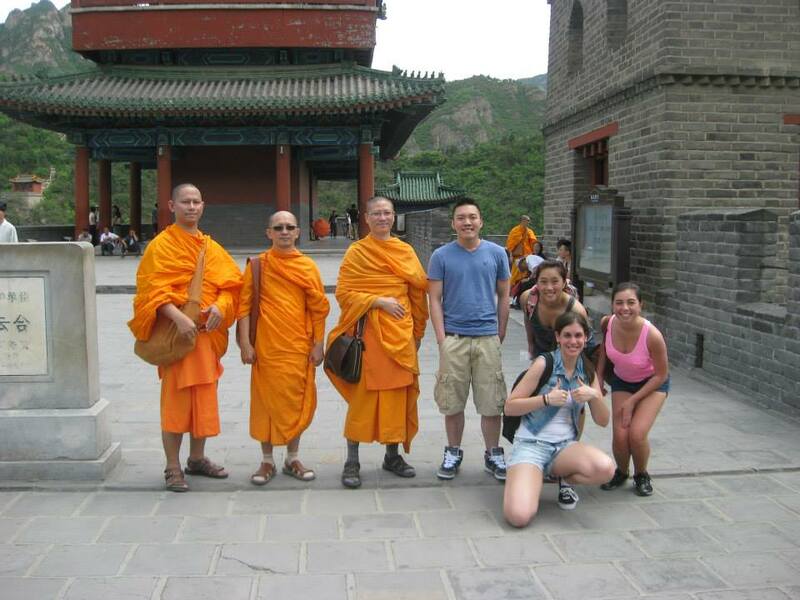 Photo op with some monks my friends and I met on the Great Wall of China. I like chicken soup. Wǒ xǐhuān jītāng. It’s probably one of the only phrases I learned to say correctly in Mandarin while studying abroad in China and it still makes me laugh one year later. No matter what college you go to, even if it’s only a few psychology courses online, everyone should go on a study abroad program at least once in their lifetime. Study abroad is a rite of passage and the college discounts you get is worth the experience. It’s the ability to say that during your young adult life you did something different and learned about a new place. It doesn’t matter what you do or where you go. What’s important is that you get out, see the world, and learn about a country that isn’t America. One of the best benefits of studying abroad is that your early 20s is the best time to travel. Besides school, and maybe a part-time job, you don’t have that many obligations. Once you’re working the 9-5 grind you’ll find it’s extremely difficult to snag any vacation days right away. Studying abroad provides you with a way to get college credits without sitting in a classroom for an entire semester. Study abroad programs usually offer a variety of courses that range from common core classes to specific credits that can be used towards your major. Studying abroad through your school is a great way to make friends that will be there after the trip. Most of the people that go on study abroad trips go to the same school. It’s very easy to form close friendships in a short amount of time on these trips. Walking across campus and seeing a familiar face is always a nice surprise in the middle of a hectic day. 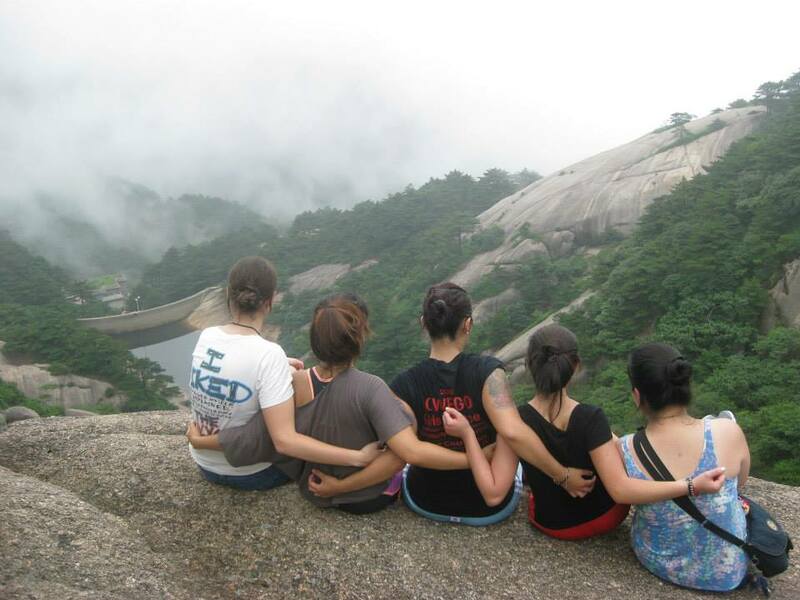 New friendships only grow stronger after hours of hiking the Yellow Mountain (Mt. Huangshan) in the southern Anhui province in eastern China. People don’t just travel because of the boredom from living in the same place. People travel because they thirst to see something new. It’s one thing to see a picture of a famous landmark; it’s quite another to actually see that landmark with your own eyes. Ask anyone that’s ever traveled anywhere, or ask anyone with a smartphone camera; no photo or Instagram filter can truly ever beat the real thing. When you go home and change your profile picture on Facebook to a picture of yourself standing on the Great Wall of China—that’s something to brag about. To learn about a culture that is foreign from your own is a truly important experience. There are so many different cultures in the world that it is impossible to count. To go through life ignorant of the world around you is a foolish mistake. Hear a different language slide past your lips. Eat a food that you can’t identify. Engross yourself in a way of living that you’ve never experienced. A study abroad trip is more than just a trip. It’s a chance to take an adventure, fill a scrapbook with memories, and tell stories to your loved ones that will last a lifetime. 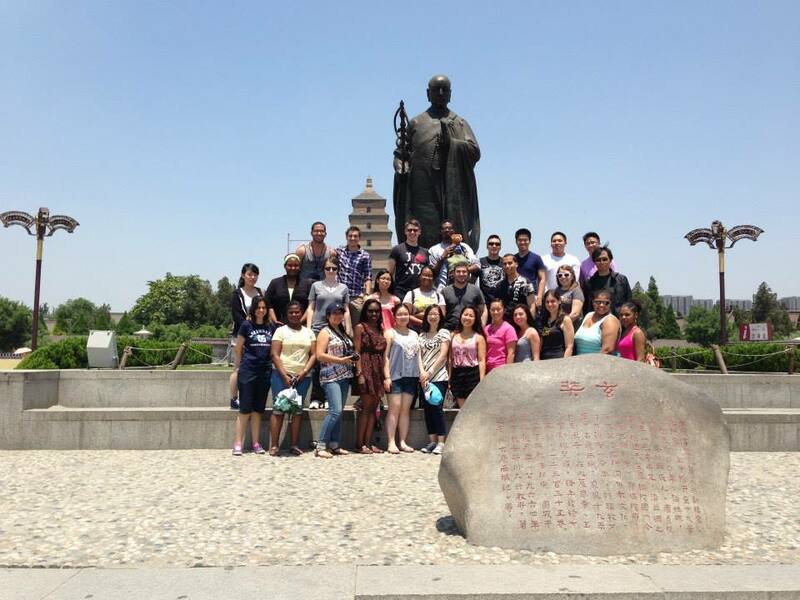 Group picture of the 2013 Summer CUNY China trip in front of the Monk Xuanzang statue in Xi’an, China.